Have you ever wanted to run a shark prison? 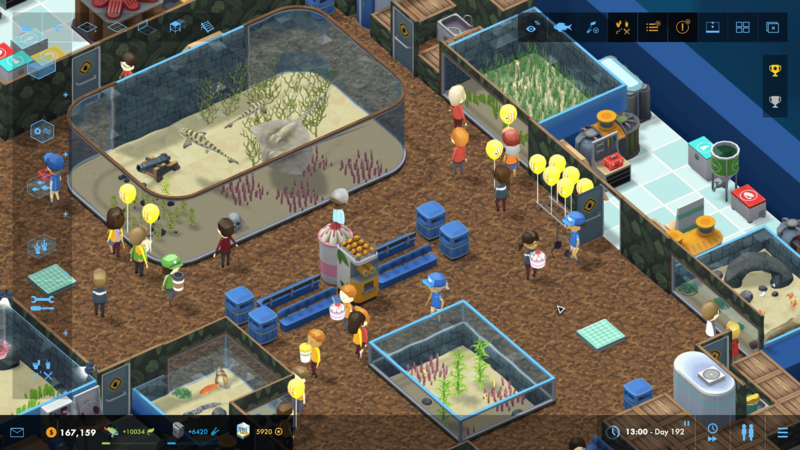 Well, now you can build and manage one with Megaquarium. 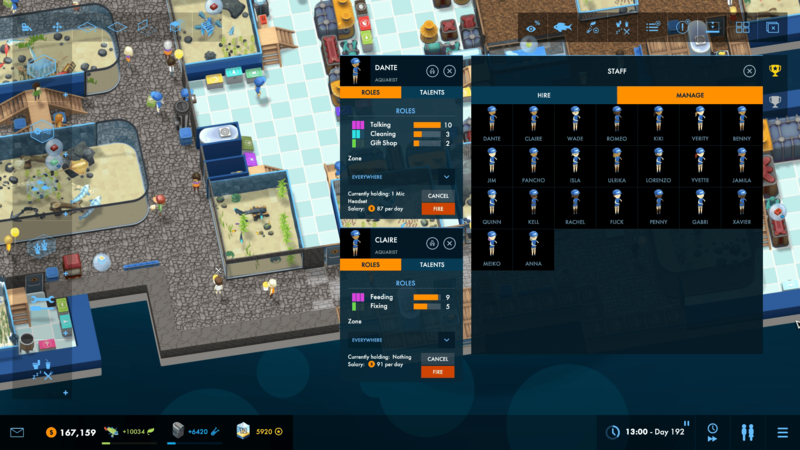 If you've played any management game before you'll already have an idea of what to expect: you make exhibits, manage employees, and try to turn a profit in the process. 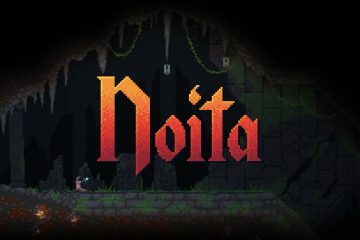 There is also a sandbox mode if you just want to let your creativity take over while you build to your heart's desire. 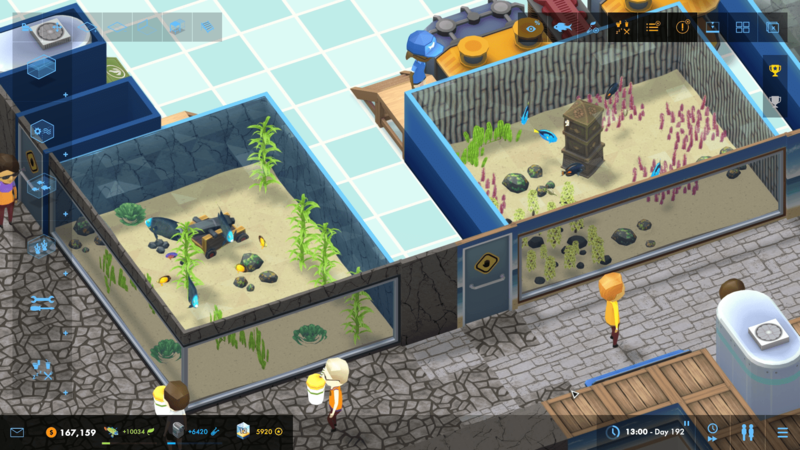 While not particularly innovative, Megaquarium manages to hit enough of the right notes to be enjoyable, especially if you fancy the idea of running an aquarium. I usually like to focus on positives first, but this is important to get out of the way: financial management is almost non-existent. 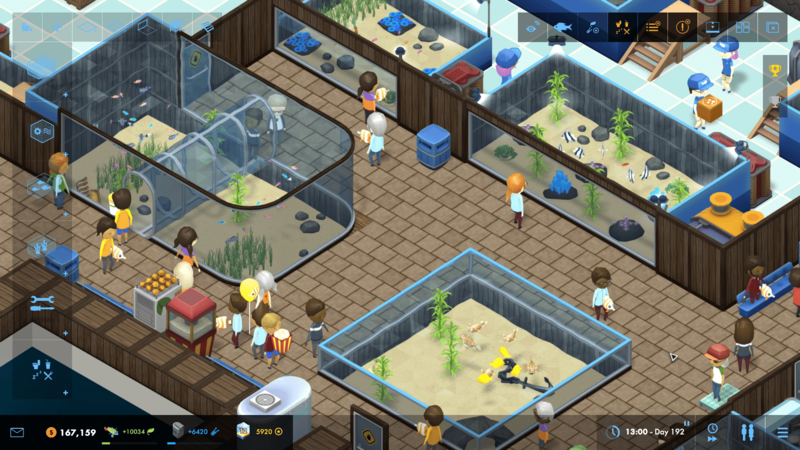 Unlike other simulation games, Megaquarium is so generous with money that it can be entirely ignored. There are harder difficulties where everything costs more, but you'll invariably turn a profit unless you actively try not to. If not being able to manage your finances is a deal breaker then this may not be the game for you. While financial management isn't present, there are a variety of other variables players will have to manage. Each of the different fish have needs that must be accounted for before a successful exhibit can be created. 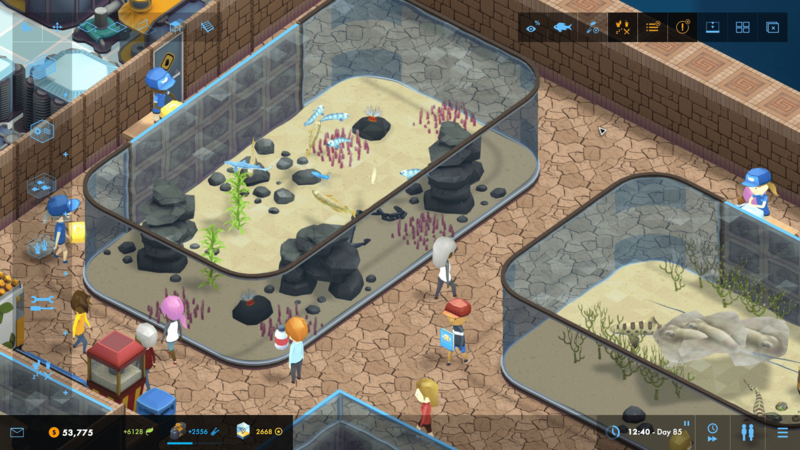 The game's first four campaign missions (out of ten) will teach players the basics such as which fish need to be in a school, which need shelter, or which prefer cold water. The biggest variable to watch out for is when fish grow because larger fish tend to eat their smaller tankmates. All of this information is available in an overlay, so even if you have erroneously placed fish together that aren't a perfect match, you can identify the problem and shuffle your inventory of fish. 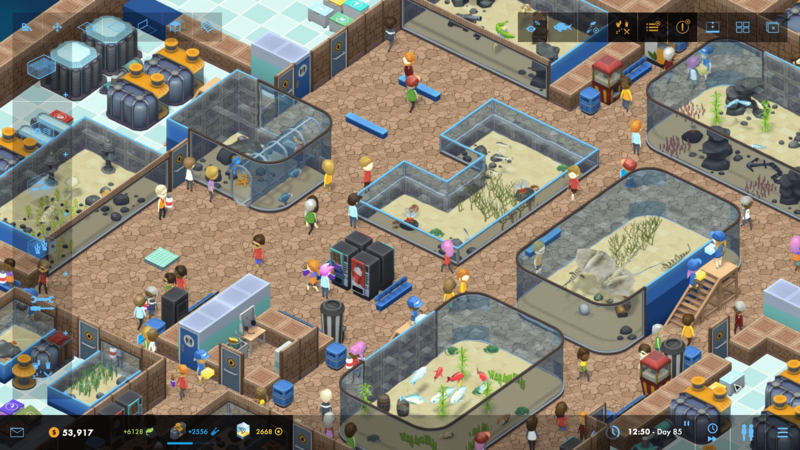 Another facet to the management within Megaquarium is the layout of the aquarium. Poorly laid out exhibits won't funnel guests through the entirety of your aquarium preventing you from getting the most out of your collection of fishy friends. In addition, the temperature and water purifying equipment for the tanks need to be regularly repaired, so if your staff can't get to the equipment fast enough you could have some dead fish on your hands. Similar to managing the requirements of fish, the ten mission campaign teaches players about these problems and what kinds of design considerations can be used to mitigate them. You also have a degree of control over managing your staff. Each staff member has skill levels for the five different activities of up-keeping the aquarium: feeding, fixing, cleaning, talking, and restocking the gift shops stands. Along with their skill levels, each staff member has a variety of stats that will determine their innate ability at any of these five tasks. Because of this, it's essential to figure out what tasks a staff member is most competent at and to invest future skill points in improving these areas. In addition to the aforementioned facets of management, players will also be managing their prestige. 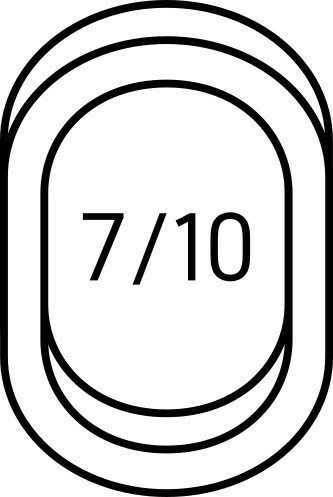 Prestige is a fame rating of sorts that shows how popular your aquarium is, and allows you to research more advanced fish and equipment for your aquarium. 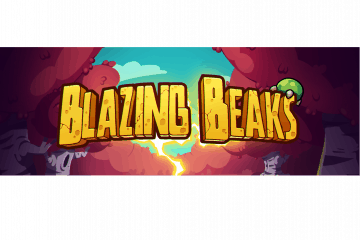 The game's AI has a series of checks to determine how much prestige any given display can generate, so building a variety of exhibits that feature several different fish and decorations will result in higher prestige ratings. 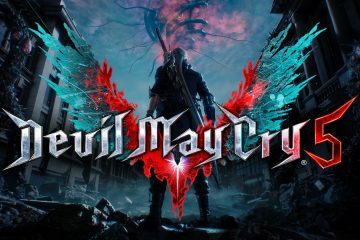 Trying to con the system will work against players however, as the game's AI tries to assess how impressed an actual human would be by each tank. You'll want to focus on variety over repeatedly stacking the best prestige generating fish and decoration. Having prestige work in this way, and tying it to progression, makes it an integral part of Megaquarium that actively discourages the player from trying to take shortcuts. 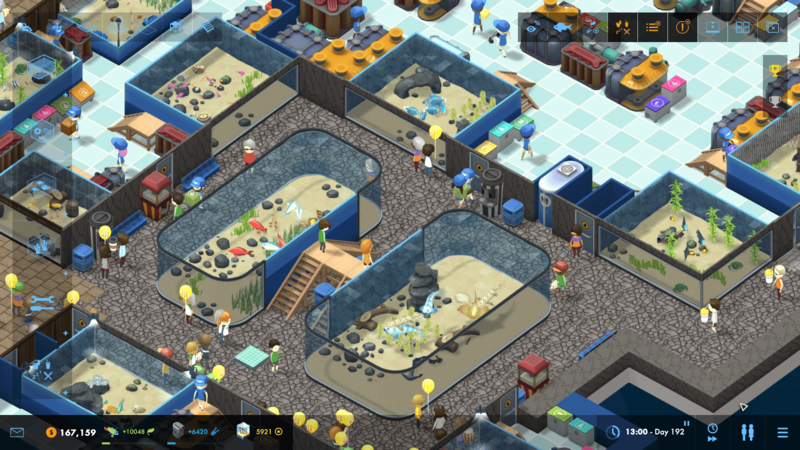 While the different management elements combine for a solid experience, I found a few nagging problems with Megaquarium. My biggest gripe was not being able to figure out why specific layouts worked with guests, while others didn't. Whether or not an aquarium layout works or leaves your guests completely bamboozled seems somewhat random, so I stuck to making my aquariums very similar. This made things a little repetitive as I couldn't pinpoint exactly what the problem was in the more complicated layouts. Having some contextual information to assist players with foot traffic would have been greatly appreciated. Additionally, having to dig through several menus for everything is a pain in the rear. 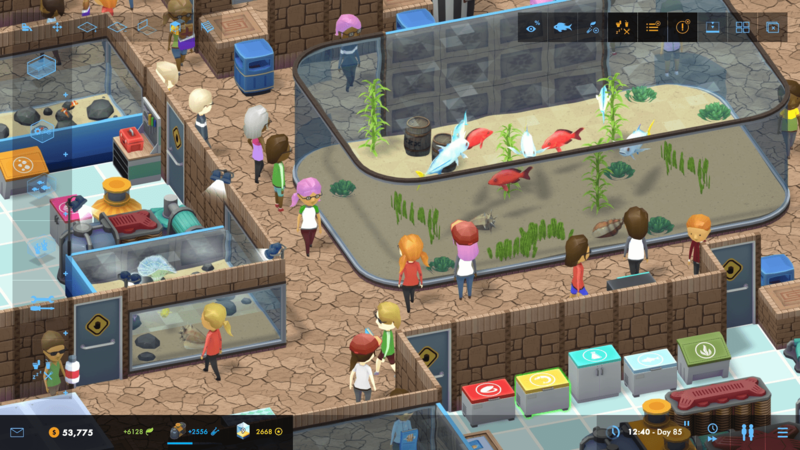 To move a fish or decoration to a new display, players must first open the menu for the current exhibit, click the fish within that menu to open another list with all the fish's details and then select to move it. Moving several decorations or fish to a new bigger tank is extremely tedious because of all the UI navigation. Speaking of menus, there isn't one for all of your fish or exhibits. To see the status of any given display you must select it individually, and for the fish, you have to click each individually from the tank. As a result, keeping track of all of the fish and displays is made much more tedious than it should be. I would have greatly appreciated a single area from which to see all this information.